« Database design 101: Is your field big enough? Folders on the host shared with the guest. We can edit code on the host machine and then test the changes in the guest directly, without having to upload / copy / publish / sync anything. Running a VM in this way has one profound annoyance: once you’re using the server, you can’t get out! The player captures your mouse and keyboard, and all input is directed to the player. You can get them back again by pressing Ctrl+Alt, but this process keeps getting in the way – stopping easy Alt+Tabbing and disrupting my working rhythm. I also had an additional problem: I use a customised version of the Dvorak keyboard layout, and didn’t fancy the effort required to set this up on Linux. Luckily there’s an easy solution. On some networks you may find that the hostname doesn’t resolve, or it may take a little time for your router to figure out what the name is. You can easily work around this by connecting directly to the IP address of your virtual machine – find it by entering the ifconfig command at the shell. 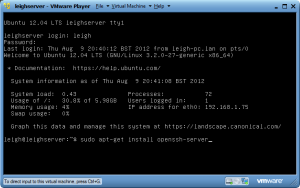 Looking this up every time you boot up the VM rapidly becomes tedious and so you may want to assign a static IP. This is a pretty simple process from the shell, although you may have to persuade your router to play nicely with this process. Once you’ve fixed the IP you can save it in PuTTY as a session, or even add a meaningful name to your Windows hosts file to make it permanent. 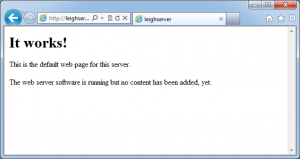 Once that’s all finished you can test by navigating to your server in a web browser. (This assumes you setup the shared drive as I did in part 1, i.e. under the name “www”). 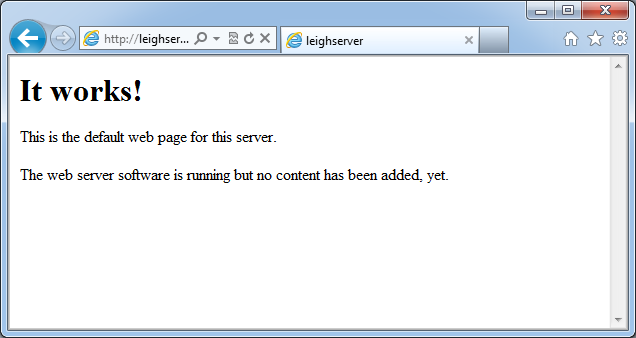 Now we can access the shared files in the webserver at http://leighserver/www/, and immediately preview changes made in the host. In future posts I’ll take a look at how we make those changes in the host, and what development tools there are to make that easier.